This super-fast, super-sleek, super-cool race car is the perfect introduction to the exciting world of LEGO Technic. It’s a realistic 2-in-1 street racer – just pull back, release and watch it fly! LEGO model number: 42011: Features easy-to-follow instructions, colourful styling and the first pull-back motor ever featured in a LEGO Technic building set. For an even more action-packed play experience, combine your model with the 42010 off-road racer for a super-fast dragster with pull-back motor, adjustable rear wing and opening cockpit! 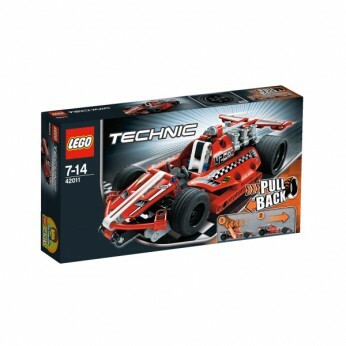 Build and race with the power of LEGO Technic! One supplied; Size H14, W26, D5cm; For ages 7 years and over; EAN: 5702014975620. WARNING(S): Not suitable for children under 3 years old. To be used under the direct supervision of an adult. 1 Question 1 Answer The super-fast, super-sleek, super-cool Race Car is the perfect introduction to the exciting world of LEGO Technic. This realistic 2-in-1 street racer features easy-to-follow instructions, colourful styling and a unique motor – just pull back, release and watch it fly. Have hours of fun racing to the finish line. For an even more action-packed play experience, combine your model with the 42010 Off-Road Racer for a super-fast Dragster with pull-back motor, adjustable rear wing and opening cockpit. This toy costs approximately £14.99 (for the latest and best prices make sure you check our retailer list for the LEGO Technic Race Car 42011 above). In our review of LEGO Technic Race Car 42011 we classed it as being suitable for ages 6 years, 7 years, 8 years, 9 years, over 10 years but recommend you check the manufacturer specific advice before purchasing.